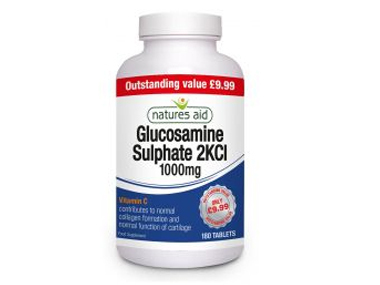 Buy Natures Aid Glucosamine Sulphate 2KCL 1000mg - 180 tablets in the UK from our online shop or directly from our independent Scottish store. Glucosamine is an amino sugar, meaning it is made from a protein molecule mixed with a sugar molecule. It occurs naturally in the body, although production may decrease with age. Glucosamine is not easily obtained from food sources, so supplements provide a safe and easy way to top up. Glucosamine is widely sold as a food supplement and has had much research carried out into its potential benefits. The Glucosamine Sulphate used in Natures Aid products is all guaranteed to be salt free as we only use the 2KCl form of the product. This means that our glucosamine is made using potassium chloride, a safe, sodium free product, which is used to stabilise the Glucosamine supplement. Natures Aid® Glucosamine Sulphate provides Glucosamine 2KCl 1000mg with Vitamin C. Vitamin C contributes to normal collagen formation and the normal function of cartilage. Where can you buy real Glucosamine Sulphate 1000mg 180's safely online? If you are wondering where you can buy Natures Aid Glucosamine Sulphate 2KCL 1000mg - 180 tablets safely online in the UK, then shop with us. Glucosamine Sulphate 1000mg 180's - Natures Aid Glucosamine Sulphate 2KCL 1000mg - 180 tablets in Joint & Bone Support and Herbal Remedies, Tinctures & Supplements.